The vertical abdominoplasty technique always had its biggest statement in correcting large hernias or unsightly scars on the midline of the abdomen. With the global spread of gastroplasty for treatment of morbid obesity, we noticed an increase in demand for the correction of intense sagging in the abdomen of emaciated patients. 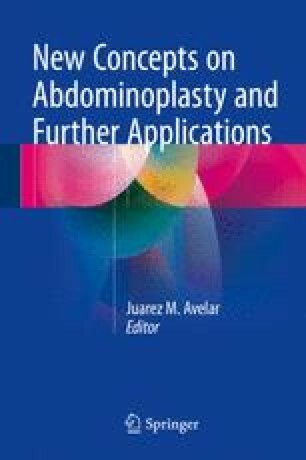 A traditional abdominoplasty is not well indicated in these cases as there is the need for skin resection also vertically to better wear the new body. There was then a huge advance in vertical techniques. In this chapter we present our surgical routine with special emphasis on refining the umbilical region. We propose routine amputation of the original umbilical stump and making a new navel from side flaps as described by Correa and Iturraspe in 1951. We introduced the dermoepidermal security strip, designed to place with pinpoint accuracy the flaps in the original navel position. The technical details as well as the postoperative care and possible complications are described in detail.